Whereas last year I was working directly with more than 40 refugee youth, ages 12-mid 20s, this time around I am training more than twelve youth mentors, teachers and volunteers on how to replicate the Me/We storytelling curriculum for at-risk youth in the refugee camp. As part of my new arrangement with Questscope, the Me/We curriculum will be taught by the refugee youth mentors from the NGOs Questscope and ACTED, and offered as a course at the new youth center being built by UNFPA. These workshops are training youth mentors and teachers on the powerful process of storytelling as a mechanism for building up the next generation of Syria’s young changemakers, problem solvers and community builders. With 57% of Syria’s hospitals destroyed, more then 3 million out of school, and a lack of doctors, electricity, clean water—these issues will need creative problem solvers and innovators to help restore Syria as a thriving country. The JEN NGO has trained a group of young refugees to be journalists for a local magazine called ‘The Road’. What if these youth journalists could be active discoverers and inspirers for solutions and ideas? 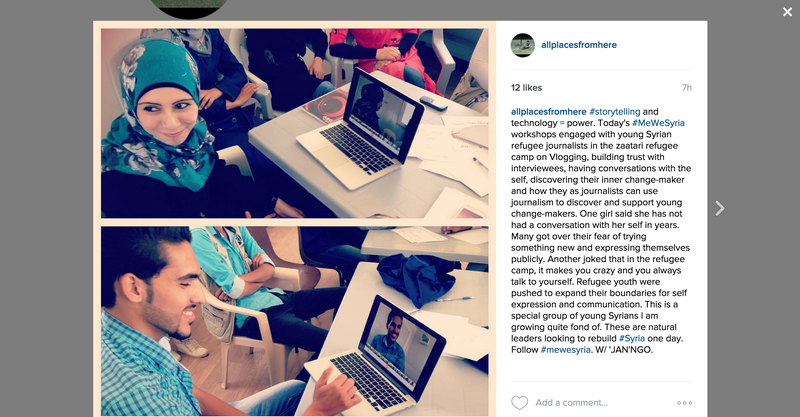 What if they practiced solutions based journalism that activated a culture of changemaking within the Syrian refugee community? 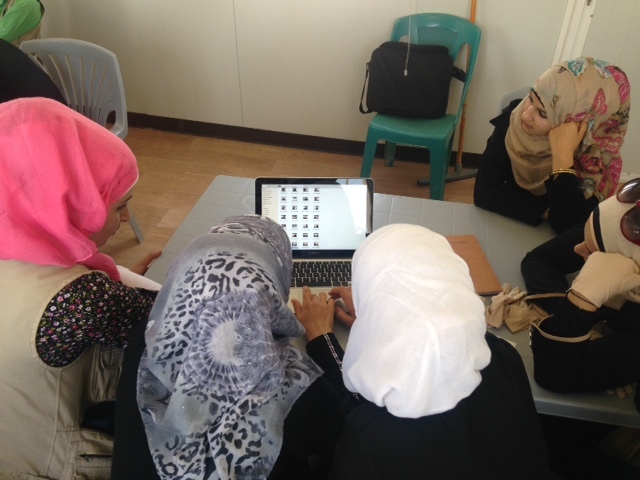 Me/We is now training these young refugee journalists on just that: storytelling for changemakers. The group are now shifting some their content focus towards valuing and promoting changemaker culture inside the camp, and solutions based journalism. All the workshops are pushing youth influencers in the refugee camp to value and promote changemaker skills: empathy, teamwork, fluid leadership and changemaking. Additionally, the refugees are learning the importance of storytelling as means to exercise self expression, pluralism, creative enterprise and the importance of making mistakes as a gateway to crazy ideas that may catalyze social change. 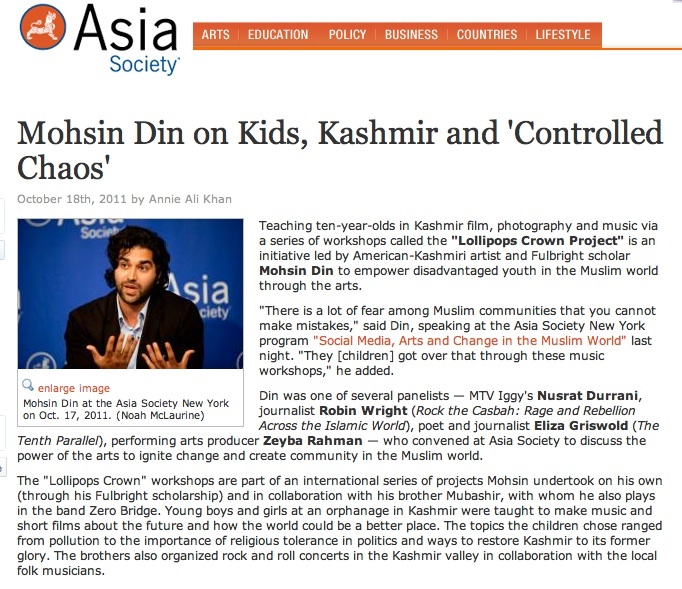 I am employing several different tactics in these workshops and integrating some of Ashoka’s Youth Venture’s ‘Design for Change’ exercises into the Me/We curriculum. In one exercise, youth teams are challenged to ideate on a real global challenge, such as cheaply and safely ridding the world of land mines. What was interesting about this was that all of the Syrian youths’ answers and ideas dealt with either awareness raising, or hiring outside experts to fix the problem for them. This is telling because it speaks to the cultural barriers that exist for communicating and valuing changemakers organically from their own community. The context of this is a lack of space for youth to express their imagination, critical thinking and creative problem solving skills. In the Middle East and South Asia, diligent memorization can often take precedence over critical thinking and risk taking in the classroom. In another exercise, I pushed the youth to start video blogging on a laptop. At first, they stare at themselves silently, afraid to click record…afraid to start communicating even with themselves! But once they overcome their fear and embrace expression, that one click becomes a click towards creative enterprise, ideation, communication and empathy. That one click become an irreversible first step to discovering their inner changemaker and to communicating changemaking around them. Me/We storytelling for changemaker workshops will be replicated by trained youth mentors and teachers, and offered as a course at the new UNFPA Youth Center managed by Questscope. This means that new groups of refugee youth– boys and girls– will be able to discover their inner changemaker and explore creative enterprise and build skills for communications, empathy and changemaking. Me/We has trained a group of youth journalists in the camp who have already finished writing, directing and producing two short films about social issues that need changemakers: child labour/education; and transportation access/ health of the elderly and pregnant women. These journalists will continue their training at the Youth Center and have access to equipment to take their magazine and storytelling to the next level. Their content will now also focus on cultivating a culture of changemakers. I have selected 4 refugee youth managers for the Me/We program, 3 from the Questscope NGO, and 1 from ACTED. These refugee managers have achieved advanced understanding of storytelling for changemaking and will manage the volunteer teachers and journalists carrying the Me/We program forward for the youth and community. The refugee youth trainers have successfully completed the training and are ready to replicate the workshops for at-risk youth in the camp. The group of youth mentors have also completed writing, editing, filming and producing their own short film. The film explores the concepts of “home” and “hope”. Each month, Me/We youth-produced films for social change will be presented at the Youth Center as a cinema night in the refugee camp. * I still need support and new partnerships to keep Me/We going for at-risk youth worldwide. If you want to help and pitch your time, skills or money, please contact me on Twitter @mohsindin or on LinkedIn or Facebook @mohsin mohi ud din. #MeWeSyria has received generous support for 2014 and 2015 workshop implementation from GERMANY. 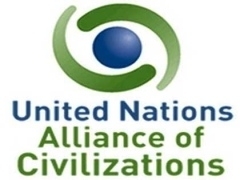 Here is part one of my new series for the Huffington Post about IIE and UN Alliance of Civilizations Fellowship I participated in this year. “I observed that an unchallenged barrier to educational partnership and reform in the education sector stems from the lack of encouragement for critical thinking within academics and lack of space for open debates that foster pluralism and a diversity of perspectives. Last night I was invited by the Asia Society to participate in a fantastic panel of cultural ambassadors, international journalists and activists. I discussed developments in the Muslim World and I also spoke about the Lollipops Crown project and showed video clips of the children in action during the workshops. Thanks to the accomplished panelists for allowing me the opportunity to speak and show videos of Lollipops Crown in Kashmir and thanks to the wonderful Asia Society for being so supportive of the work. 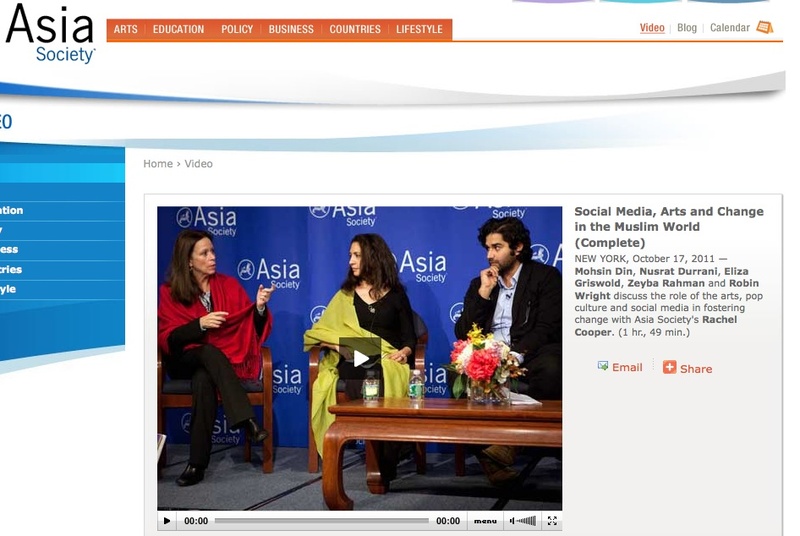 This panel is part of the Creative Voices in Islam in Asia program of the Asia Society. Take aways form the panel: ‘music is homeless’ Nusrat (MTV Iggy) ; cultural forms of expression are equally important as political developments-Zeyba (Cultural Ambassador) ; and author of Rock the Casbah, Robin Wright–the counter jihad will define the next generation. Watch the video from the link above to hear the amazing programs being done for cultural exchange and see videos from each of the panelists.